"The family will go wild for this peanutty fudge. Peanut butter, chopped peanuts, and white chocolate really make it special." In heavy saucepan, heat sweetened condensed milk and peanut butter over medium heat until just bubbly, stirring constantly. Remove from heat. Stir in white chocolate until smooth. Immediately stir in peanuts and vanilla. Spread evenly into wax paper lined 8-or 9-inch square pan. Cool. Cover and chill 2 hours or until firm. Turn fudge onto cutting board; peel off paper. Sprinkle with additional chopped peanuts if desired. Cut into squares. Store leftovers covered in refrigerator. 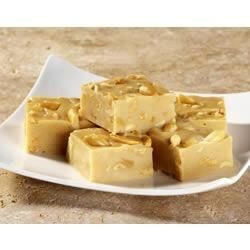 This fudge recipe is great. I also substituted white chocolate chips and they melted very well into the fudge mixture. It's so easy and you don't have to mess with a candy thermometer. I had trouble making the other fudge recipes without burning them. This was sooo easy and so good. To make it even easier, I'd use white chocolate chips so you don't have to cut up the squares. This is this best fudge I have ever ate! That's saying a lot because I am a peanut butter fudge lover. Awesome, Awesome, Awesome!!! This recipe was so easy and is soooo good. I will be making this again!